A long-unknown, 150-year-old trove of handwritten ledgers and calfskin-covered code books that give a potentially revelatory glimpse into both the dawn of electronic battlefield communications and the day-to-day exchanges betweenAbraham Lincoln and his generals as they fought the Civil War now belongs to the Huntington Library, Art Collections and Botanical Gardens. The collection, acquired in a private sale on Saturday and disclosed Wednesday, includes 40 cardboard-covered albums of messages that telegraph operators wrote down either before sending them in Morse code, or transcribed from telegraphic dots and dashes at the receiving end. There are also small, wallet-like booklets containing the key to code words Union commanders used to make sure their messages would remain unfathomable if intercepted by the Confederates. Since I started blogging about history a few years ago, I’ve spent quite a bit of time perusing news feeds, looking for history-related items that might make for suitable posting fodder. Because of the way search engines operate, they’ll often pull up irrelevant articles simply because the articles in question contain a particular word or set of words. I’m often struck by how many news stories reference “Abraham Lincoln” even though they have little to do with him, just because the reporter who wrote the article decided that a Lincoln quote would spice things up, or because the subject of the article decided that invoking the Great Emancipator would be a good idea. To illustrate the ubiquity of Lincoln quotes—both authentic and spurious—here are a few examples taken from items I stumbled across in the last couple of days. In a news story about husbands and wives supporting different candidates in South Carolina’s Republican primary, one reporter invoked Lincoln’s famous “house divided” metaphor, which in turn was a quotation taken from the New Testament. The governor of Colorado, in promoting a public opinion initiative earlier this month, quoted a passage from Lincoln’s debates with Stephen Douglas. A recent story about a Kiwanis club’s efforts to aid children included this nugget: “Lincoln said, ‘No Man Stands So Tall as When He Stoops to Help a Child. '” A number of websites attribute the statement to Lincoln, but as far as I know, he never said or wrote any such thing. A Nigerian newspaper issued a story on petroleum subsidies, opening with the quote, “If you would win a man to your cause, first convince him that you are his sincere friend.” I’m not sure what this has to do with petroleum subsidies, but at least that quote is authentic; it comes from a speech Lincoln delivered to a temperance group in 1842. Comedian Stephen Colbert told fans at a rally, “As Abraham Lincoln said at Gettysburg, ‘Give me some money. '” Needless to say, you won’t find that statement in the published Lincoln corpus. I can’t think of any other historical figure who is quoted and misquoted so often, and in so many different contexts. I suppose this has to do with Lincoln’s reputation as a wordsmith and the high regard in which he’s held as a paragon of wisdom and prudence. A Lincoln quote is an automatic appeal to authority; if the man who wrote the Gettysburg Address, won the Civil War, and freed the slaves can help bolster you’re argument, then you’re already more than halfway there. This need to get Lincoln on one’s side has led to so many misattributions that you can find websites devoted to debunking them. If even the current President of the United States is not safe from this phenomenon, then maybe the safest bet is to stick with the well-worn examples from Lincoln’s undisputed published writings, or perhaps to rely on our own rhetoric and stop trying desperately to get Lincoln on our side. A researcher working for the Papers of Abraham Lincoln project has uncovered new documents at the National Archives, including the first page of the official copy of his Second Annual Message to Congress. Fellow-citizens, we cannot escape history. We of this Congress and this administration, will be remembered in spite of ourselves. No personal significance, or insignificance, can spare one or another of us. The fiery trial through which we pass, will light us down, in honor or dishonor, to the latest generation. We say we are for the Union. The world will not forget that we say this. We know how to save the Union. The world knows we do know how to save it. We—even we here—hold the power, and bear the responsibility. In giving freedom to the slave, we assure freedom to the free—honorable alike in what we give, and what we preserve. We shall nobly save, or meanly lose, the last best, hope of earth. Other means may succeed; this could not fail. The way is plain, peaceful, generous, just—a way which, if followed, the world will forever applaud, and God must forever bless. 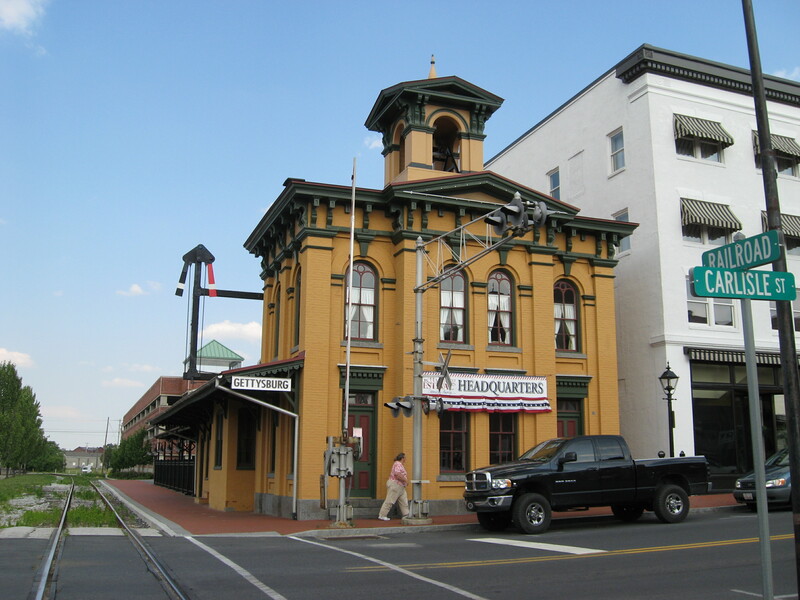 The train station in Gettysburg at which Lincoln arrived on his trip to deliver his famous cemetery dedication speech may become part of Gettysburg National Military Park. The station is just a short distance from the David Wills House, where Lincoln stayed during his visit to Gettysburg; the NPS took over the management of the house in 2004, and re-opened it to the public in 2009. Mr Holzer, who has written more than 40 books on Lincoln and the Civil War, made his assessment after trawling reports of the president’s speaking tours, eyewitness accounts and newspaper commentaries. His conclusion was that Lincoln was most certainly a tenor. During earlier research, Mr Holzer found that many first-person accounts of Lincoln’s public speaking were always revealed surprise at his initial sound and appearance. He said: ‘They all seem to say, for the first ten minutes I couldn’t believe the way he looked, the way he sounded, his accent. Whatever his personal views, Paul categorically opposes the legal construct that ended state-sanctioned racism. His libertarianism involves not only the abolition of the Department of Education but also a rejection of the federal role in civil rights from the Civil War to the Civil Rights Act of 1964. I think Gerson is overstating his case, but my intention here is not to take issue with either Ron Paul’s political inclinations or Gerson’s interpretation of them. It’s to note that the Post editorial touches on some important points regarding America’s political trajectory. The Civil War was a critical stage in the gradual transformation of Americans’ relationship to the federal government. The generation that founded the Republic believed government was the most important potential threat to liberty, and restricted both the federal government and the state governments they created. Over the course of the 1780’s, some of them became convinced that their federal government was too restricted, and accordingly set up a new, more vigorous one. But even this strengthened national government was circumscribed within limits and greeted with some controversy. For much of the nation’s early history, Americans perceived the relationship between government and liberty as fundamentally adversarial. As historian James McPherson has noted in an essay printed in his collection Drawn with the Sword, the Civil War marked a turning point from a prevailing American belief in negative liberty (freedom from) toward positive liberty (freedom to). Whereas the first amendments to the new Constitution prevented the government from infringing on rights, the Reconstruction Amendments ratified after the war used the government as a force to extend and safeguard rights. The relationship between liberty and government was not necessarily adversarial anymore. Out of the conflict came an opportunity to flex the government’s muscles on behalf of both negative and positive liberty at the same time—negative liberty because the end of slavery also brought about an end to those laws that upheld the institution, and positive liberty because government was the tool that struck off the chains. Even before the war, the Whig Party had already demonstrated a certain degree of willingness to use government as a tool to foster national development, with federal support for internal improvements like roads and canals, and the former Whigs who filled the ranks of the new Republican Party when their own party splintered in the 1850’s brought their old political attitudes with them. Lincoln, the loyal Whig who became the first Republican in the White House, provides the perfect example. As a young legislator, he wanted Illinois to adopt the same internal improvements that Whig leader Henry Clay advocated on a national scale. Even during his presidency, with the Civil War occupying so much of his attention, Lincoln still managed to indulge these Whig tendencies. It was he who signed the legislation enabling the construction of a transcontinental railroad, although it remained unfinished until four years after his death. In its infancy, then, the Republican Party was in a sense the party of “big government”—or at least the closest approximation to such a party that existed at that time. In the decades after the war, the political landscape continued to change. The emergence of big business and the problems that plagued the nation’s growing cities convinced many Americans that a vigorous government was no longer the only significant threat to liberty, and could in fact be used as an agent of reform. This conviction that government offered a remedy for the ills of late nineteenth-century America gave rise to the Progressive movement. The twentieth century, of course, brought further extensions of federal power and more political re-alignments, during which the Republicans transformed into a party advocating limits to the national government’s role. Drawing a direct line from the Republican Party of the 1860’s to that of today, as Gerson seems to do in his editorial, is thus something of an oversimplification. But, of course, no one would disagree that Ron Paul’s desire to reduce the power of the national government is much greater than that of the other GOP contenders. That is because even today’s Republican Party, though it is no longer the party of big government, takes for granted a degree of federal power that would have seemed extraordinary in the age before the Civil War changed the relationship between government and the people, and between government and liberty. In this new election year, Republicans in particular and Americans in general will once again be faced with the question of how much power the federal government should wield, and in what manner.